Al, I think it was nine-weeks between the black one and the blue one. You'll find that the exterior of the roof no longer gets hot from the overhead interior light with the LEDs. Coulthard - "I owe it all to Jim Clark." The cynic in me says that should you have said Rolex was sponsoring the event, and HRH The Princess Royal was in attendance the response from JYS may have been different. Nope. Accelerate hard perhaps, but brake hard and the coffee will fall forward onto the floor. Unless you mean brake hard, whilst reversing at speed? Pedant mode off now! Has there ever been a more cryptic and less informative thread? I'd like to thank the team from BEAR Scotland. Without their care and dedication to the maintenance and upkeep of the trunk roads of East Central Scotland, this would not have been possible. Press car....Built better or been driven like its been stolen. Bear in mind that your car's life with Lotus was 10 years ago. The benefits and problems of being on the press fleet will be long gone. It's more recent history will be of greater relevance. Spend a few pounds on a couple of decking squares, and drive onto these when you need to jack the car. They are large enough and stable enough to drive onto, and will raise the car sufficiently to get a jack underneath. 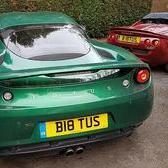 I've gone fron Exige 240 to Evora, to Elise S/C to Evora S. The S is a great car, but if you are getting 22, I have to ask if you are trying hard enough. I seem to have a ceiling of 20.